The final round of the 2018 FIA World Rallycross championship saw Johan Kristoffersson taking his eleventh win from twelve rounds at the Killarney International Raceway. The second event held at the circuit outside Cape Town will be remembered for some good performances, but sadly also showed a severe decline in spectator numbers compared to the 2017 event. Although Kristoffersson made it look easy during the semi-final and final on Sunday, November 25, there was a very real possibility that he would not have participated in the weekend's action at all. On Friday afternoon, the PSRX Volkswagen Sweden team's paddock space only featured two golf karts and some tables. Both the VW Polo R's and equipment still needed to clear the Cape Town harbour customs following shipping delays. By 18:30 Friday afternoon and thanks to swift intervention from the City of Cape Town mayor Dan Plato, the team could finally start setting up for the weekend ahead. During Saturday afternoon's first qualifying race Kristoffersson encountered mechanical issues which saw him only ranking in sixteenth position and more than 30 seconds of the pace set by Sebastian Loeb; the only other competitor to win a championship round during 2018. Kristoffersson, however, made a sterling comeback during the other three qualifying races to head into the semi-finals as the top-ranked driver. Loeb found himself in second place ahead of Team Peugeot Total teammate Timmy Hansen. Kristoffersson's teammate Petter Solberg found himself in fourth position ahead of the EKS Audi Sport duo of Andreas Bakkerud and Mattias Ekström. Kristoffersson sailed through the first semi-final with both Timmy and Kevin Hansen making it into the final as well. A good battle for second place developed during the early part of the six-lap race, but this didn't last for too long due to the retirement of Bakkerud. The second semi-final saw Solberg taking the win while Loeb beat Ekström to second place. This set up a thrilling finale to the weekend. Kristoffersson kept to the inside line to retain the lead through the first corner while Solberg took the wider outside line allowing Ekström to be in close pursuit as they approached the middle of the lap. While Kristofferson pulled away, drama unfolded on the second lap with Solberg spinning out on the dirt section before getting hit by an unsighted Timmy Hansen. This eliminated both cars from the race and more crucially also brought Solberg's hunt for second place in the championship to an end. Kristoffersson took his record-breaking eleventh win for the season ahead of a good battle for second place in which Ekström beat Loeb. Kevin Hansen finished in fourth position. Ekström also finished the 2018 season as runner-up; his final season as full-time championship driver. Bakkerud took third place in the championship ahead of Loeb, Solberg, Timmy Hansen and GRX Taneco's Niclas Grönholm. As was announced earlier during the season, this was also the last round featuring Team Peugeot Total. In the RX2 feeder class, Ben-Philip Gundersen took the win ahead of Sondre Evjen and Vasily Gryazin in an incident-filled final which saw Oliver Eriksson sidelined early-on. Eriksson, however, secured his title earlier during the day already with Guillaume De-Ridder finishing as runner-up. The RX2 class also saw Ashley Haigh-Smith, South Africa's sole entry for the event finishing in sixteenth position and therefore eliminated following the fourth qualifying race. Off the track, one of the major talking points from the weekend was the severe decline in spectator numbers compared to the previous year. Granted, 2017 saw the first FIA international event being hosted in South Africa in almost a quarter of a century which did see a large number of spectators flock to the circuit from around the country as well as neighbouring states. The sharp decline in 2018 could be attributed to South Africa's struggling economy with everyone really having to make their Rands last longer. One-day passes were only made available just over a week prior to the event in an effort to increase sales. Another factor which certainly played a part was the impact from the five-week illegal strike hampering the operation of the city's troubled public transport system. With spectators having to pay for parking at the facility and with spaces being limited, the public transport system would've been a perfect shuttle service. Sadly the attitude of some local people could've played a part as well. A quick read through relevant social media posts saw the topic again being raised about spectators being unhappy about having to purchase food and drinks from vendors instead of bringing their own along as they would do at smaller regional events. Even more ludicrous are some "bang for your bucks" comparisons being drawn between club racing for which you pay R80.00 per ticket and an international meeting which is widely being called the most entertaining form of motorsport around. That said, if you missed the event you've missed one of the greatest forms of entertainment to grace South Africa's shores. 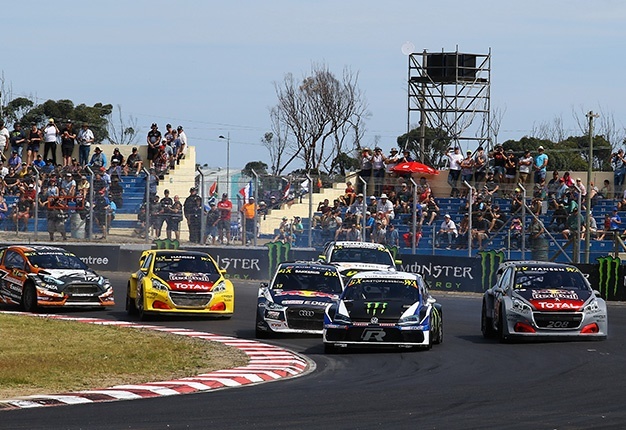 In 2019 the FIA World Rallycross championship will again conclude their season at the Killarney International Raceway. Tickets are on sale already and for sure this will again be an event worth attending.